A warm welcome to you all! Come on in, stamp off the snow and let us take those coats, hats, gloves and scarves. So pleased you like our welcoming festive porch and doorway! We’ve been busy making the house ready inside too with guests of all ages in mind as as we approach the big day. Whether in the kitchen, dining room or living room, the comforting trend of log burners being installed as focal fire features in thousands of homely abodes stays strong. In the quest for happy, household hygge, new burners need to also be made safe for younger members of the family, whether they’re resident or visitors. Wobbly toddlers, inquisitive pets and even more mature, staggeringly merry, merry makers all need consideration so that the host and hostess with the most and mostest can leave the room to focus a free-flowing river of festive fare. So how can we keep fires safe in style? Wood burners aren’t always set back into fireplaces. Unless the fireplace is particularly deep, the burner will jut out and often, especially in modern properties, burners aren’t surrounded at all. 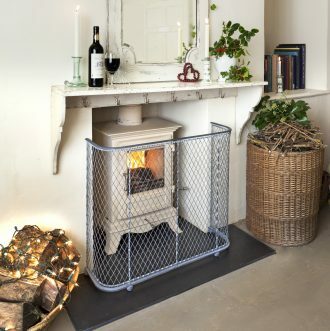 As it’s not easy to come by fire guards that wrap round protruding log burners, the workshop team at Garden Requisites can create bespoke shapes based on a stylishly barred contemporary design of fireguard and the more traditional Victorian-inspired nursery wirework guard. Care in crafting is important here. Solid steel, weighty ball feet keep the fire guard steady and grounded if knocked and the Contemporary Fireguard bars are purposefully more closely spaced than the average cat’s whiskers for good reason. It’s written deep into our DNA. We’re all drawn to gather round a fire with family and friends. At Christmas time in the depths of mid winter we slow down to spend more time at the fireside, chatting, playing games, watching TV, having forty winks, or simply fire gazing. Good reason to really go to town on decorating this cosiest of Christmas zones. If you’re lucky enough to have an original Georgian, Victorian or Edwardian open fireplace with a magnificent mantelpiece then the stage is set for the Christmas wow factor – mirrors above and mantelpieces themselves can be festooned with sweeping swags of natural and/or gold/silver sprayed foliage, dried flowers and fruits. Be careful with candles though. These can glow long and low with maybe a more minimal, modern display of metallic ornaments, simple tea light candle holders and tall candlesticks, standing stars and candle lanterns. For a more Scandi style, sweep rustic bunting across the front of the mantelpiece, or hang red and white striped butcher’s string with handcrafted decorations. For more eye-catching ideas Houzz is a great online reference for looks and suppliers. The following idea book shares 10 ways to decorate a Christmas mantelpiece and this one takes a tour around a fabulous ‘Victorian family home made for Christmas’ with a divine modern twist. Now where were we? Everyone’s settled around the fire. Just off to break open the marshmallows. May we wish all our lovely customers a very merry Christmas and a happy, healthy 2017!